Will a Pool Fit in My Small Baton Rouge Backyard? With spring just around the corner, every part of you is itching to get outside. And this year, oh, this year is going to be magnificent. You’ve been saving and planning for a big backyard overhaul, with one key desire in mind—an in-ground pool that’s all your own. The only problem is, your backyard isn’t exactly spacious. So, is an in-ground pool feasible for your small space…or would all your ideas for a truly custom in-ground pool take up too much square footage? Have no fear! There are several in-ground pool options suitable for small backyards. Check out our 4 favorite pint-sized pool options for your Baton Rouge backyard! Cocktail pools are the perfect fit for those looking to entertain in an undersized backyard. 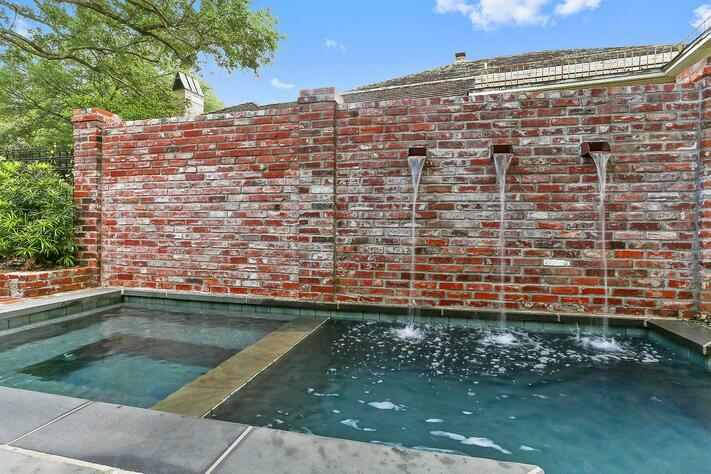 Durable but completely customizable, a gunite cocktail pool in Baton Rouge can be designed to fit any space without sacrificing your favorite pool accessories—like dynamic water features, ambient lighting, and even underwater jets. Whether you’re looking for a classic geometric cocktail pool or something a little more freeform, the Baton Rouge pool design experts at Lucas Firmin Pools are here to work with your desires, space, and landscaping to create the pool that’s the ideal size and shape for your backyard. Has your narrow or oddly-shaped backyard forced you to put your dreams of a personal exercise pool aside? It’s time to turn that neglected dream into a reality. Lap pools are shallow, generally rectangular swimming pools which can be designed to run along the perimeter of your property—adapting to corners and natural topography as necessary. Or if you’re looking for a small pool that generates the resistance workout of long-distance swimming (without all the turning), your Baton Rouge pool can be modified to include a swim current generator—such as the Fastlane System—without sacrificing the style and durability of a custom-designed concrete in-ground pool. Are you a fan of hiking? Have you ever jumped into the cool basin of a waterfall after a long, sweaty hike? It’s energizing, isn’t it? Well, when it comes to a Louisiana summer, slogging through the hot, heavy air can feel just as arduous. With a gunite or concrete plunge pool, you can recreate that invigorating dive every day after work (or breakfast) without taking up undue space in the yard! In Baton Rouge, plunge pools are deep, but not necessarily wide, which is perfect for cooling off on a hot day! Plunge pools also offer the proper depth for treading water—talk about a cardio workout! At Lucas Firmin Pools, our team of Baton Rouge pool building and maintenance experts are dedicated to working with you and your space. Whether it’s a lap pool with the depth of a plunge pool or a plunge pool with all the bells and whistles of a cocktail pool, Lucas Firmin Pools is here to give you a custom inground pool that fits your style and your petite Louisiana backyard. For more information or a free consultation, give the team at Lucas Firmin Pools a call today!